This article may disrupt the Community College system because I am going to make suggestions that are non-conventional but are proven in successful companies like Google, Facebook, Netflix, and Toyota. Applying their best practices in development and operations should theoretically work within any higher education institution. I have worked in the Information Technology department for a California Community College District for almost twenty years. I am often pulled into meetings to help brainstorm technology solutions to meet our strategic goals. It is my favorite thing to do, and I spend a tremendous amount of my personal time trying to stay abreast on the latest higher ed technology trends. Over the past decade, there has been a distinct pattern we cannot ignore at Community Colleges. The problem is that the business processes we have built behind the scenes to support these incredible initiatives are not streamlined. We are so hyper-focused on the solutions and what we need to buy to “solve” the problems that we neglect our internal business practices. In some cases, the technology itself is a crutch to help us maintain bad habits. No shiny piece of technology is going to solve all your problems until you fix your internal workflows and processes. I am not trying to be a roadblock for innovation. Like any true web geek, I am enamored by all new technology, but that technology will run much better on a well-oiled machine instead of a hamster wheel. I decided to take the best practices highlighted in the “Phoenix Project” and the “DevOps Handbook” books, by Gene Kim, Patrick Debois, and John Willison. The books focus on how to create world-class agility, reliability, and security in technology organizations. One important point they made in the book is that every business is transforming into a technology company. Every business needs technology to stay competitive, and any company who doesn’t think that is true is about to be disrupted. I did my best to translate the best-practices described for the top technology companies and apply them to Community Colleges. Understanding and streamlining your “value stream” helps you identify your technical debt within the college. Consider the value stream as a sequence of activities done within one department, college or district-wide. Whenever you take an item, maybe a form submitted by a student, process it, provide a deliverable or an expectation of outcome from a student then that process from start to finish is a value stream. The value occurs when you make your deliverables or meet expectations, so you need to evaluate all the steps along the way to see where items lose momentum or value in the stream. Students applying for admission -> then everything that happens in-between before they get they register for classes. Students applying for financial aid -> then everything that happens in-between before they receive their first payment. Faculty creating new curriculum -> then everything that happens in-between until it is state approved. Manager submitting a Personnel Action Form (PAF) for a new position-> then everything in-between until that position is filled. A staff member requests new technology -> then everything that happens in-between until the item is delivered. A staff member submits a facilities work order -> then everything that happens in-between until their issue is resolved. At a community college, we have thousands of simultaneous business processes flowing in multiple value streams every day. Our goal is to eliminate time wasted and identify where items get stuck in queues, to minimize the amount of work we have “in-progress” so we can react to urgent issues without bottlenecking our value stream. Trying to consolidate two books into one concise article focusing on higher education is a challenge. 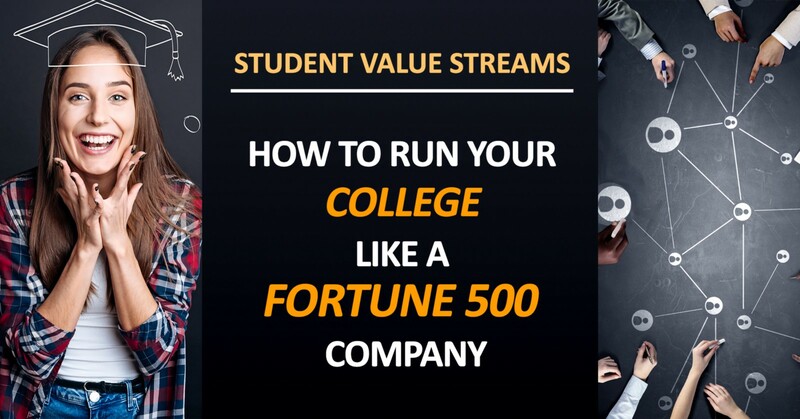 For this section, I am going to use “student success” value streams as my primary example. These are the things that you need to do to ensure student success. I will summarize each item individually. Constraints cause blockages in your value stream. If you do not identify and eliminate your constraints then any efforts you make to increase efficiency will result in a bottleneck. I always assumed your team was only as strong as your weakest link and that your constraint was based on your weakest player. It turns out your constraint may be your best performer because your best employee is usually stretched thin over multiple projects. By being involved in those projects, they garner all the institutional knowledge from solving problems. Managers tend to reward their best employees by giving them additional work because they know it will get done well. Unfortunately, that results in creating more inefficiencies in your department. The other employees miss out on critical learning opportunities that will help grow them into stronger employees and alleviate your constraints. When your business processes are inefficient, then heroics are required at almost every stage of a value stream to push things along. We have all “saved the day” and proudly patted ourselves on the back, but the truth is that unplanned heroics within an organization is a sign of weakness and poor planning. If your team is spending significant time putting out fires, that is a form of waste in your value stream. You would rarely need heroics if the proper procedures were put into place. Are you one of those people who struggles through 12+ hour days to try to keep your department afloat? Maybe it is time to do some self-reflection on what processes you may have in place that are resulting in you having to sacrifice a healthy work-life balance. Are you failing to delegate? You may be the cause for your long days, and incremental changes in your business processes could help you have more time in the evenings with loved ones. Your workaround may take you five minutes, so you do not consider it a big deal. It only takes five minutes, so you proudly share your quick workaround with others. However, if it impacts 1000 employees, 5 minutes daily, you end up wasting significant time. Also, that 5-minute workaround may be caused by a more substantial issue and by not dealing with the larger point, you’re allowing it to escalate into what may later become a catastrophic problem. A very simplistic example of a common workaround in tech is buying a new computer because yours is too slow. The problem is that the software itself is bloated and if the software were optimized then you wouldn’t need a new computer. You end up buying brand new computers so you can “keep up” with the latest software. Consider this with student services. Do you implement new solutions to enable you to continue to have bad processes? For example, are your students still printing forms, filling them out and you are scanning or retyping them into a database? You think your solution to make things more efficient is to get a bigger, faster scanner but your answer should be to eradicate the scanner and have students submit their forms online. There’s a complex “work in progress” equation, but the gist is that there is an exponential correlation to the amount of work you have on your desk and the amount of time it will take you to complete. The work keeps building, and it takes longer and longer for you to complete the last task in the queue. If this is happening to multiple people within your business process, then your value stream has significant “wasted time” where it is sitting in an inbox waiting for action. The goal is you want to reduce the “wip” or work in progress. It’s very common that when we have projects, we metaphorically throw the ball into someone else’s court and we wait for them to respond. We may wait several days or weeks before following up, assuming we did the “handoff” and it is now their responsibility. Sometimes we forget about it completely, out of sight, out of mind. Technology companies use a tool called a Kanban board so no piece of “work” is ever forgotten. It is either in your “to-do” list, “pending” or “done.” It holds everyone accountable and maintains transparency in your value stream. If you were to diagram the workflow for a process within your department, how many handoffs are there? Each time work is passed from employee to employee or department to department, we require various communications (email, phone calls, meetings, etc…) and some knowledge is inevitably lost with each transfer. Plus, not everyone at each stage of the process can immediately respond to that item, and it may get lost in a queue. Best practice is that you need to reduce handoffs by permitting individuals to do more. The more you allow one person to accomplish, the more efficient your process will be overall. The amount of time it takes to transfer something from one department to another is considered “motion.” You want to eliminate time in motion. You want to try to do as much as you can within your departments because any time spent waiting for someone else is wasted time. In factories the longer an item sits in the queue, the more it becomes obsolete. Essentially items in a queue lose their value as time progresses. If a student is waiting on something, and they need it done by Friday, but it doesn’t get done by Friday then that partially done work became obsolete. It lost its value, and that work is now unnecessary. If a student submits a form and it requires several follow-ups, then that is a form of “rework.” Your forms should be built to be comprehensive and prevent a student from failing to provide essential information. You need to identify and eliminate “extra processes” which is any work that you’re performing that does not add value. Do you have services that you are offering services to the students that are overly complex or aren’t adding value? Do you have reviews or approvals that add an unnecessary layer of red tape? Maybe you have these approvals because you lack transparent processes and it is a crutch for an inefficient, non-transparent system. Ask yourself, is this being approved, so everyone knows it’s happening? Is there a better way to communicate rather than adding to the bureaucracy and slowing down your value stream? The reason we set up these bureaucracies is that we’re worried about people working in silos and doing something that may have a negative impact. However, if you make your workflow transparent so that everyone can see the progress of work, then you reduce the possibility of negative impact. You minimize the possibility of forgetting to bring in a vital person into a decision, or that information is not being shared down the hierarchy. Tasks switching is considered a hardship or waste because every time you pivot back and forth between tasks, it takes your brain time to refocus. How often are you interrupted during the day? Try to minimize interruptions so you can stay in the mental “zone” to get your work done. Allocate set time slots to check-in with people, so if something can wait until that window of time, then you are better able to focus on the tasks at hand. You want to reduce manual work as much as possible which will significantly reduce the chance for human error. When you receive incorrect, missing or unclear information, then that is considered a defect in your business process. How can you set up your process to prevent defected submissions from reaching your desk? Maybe the defect was due to an “exception” in your process. If the exceptions become something that you’re doing a lot, then try to find a way to automate it. In a factory, if there’s an issue on the assembly line, the team leaders are alerted and immediately work together to resolve the problem. If that problem can’t be solved within a specific time, let’s say 55 seconds, then the production line is halted. This procedure allows the entire organization to mobilize and assist until a successful countermeasure has been deployed. Now apply that to student services, we need to set a designated amount of time to get all hands on deck to solve an issue. The reason you want to do this is that you want to prevent this problem from stonewalling before it progresses downstream. The longer the student continues with these problems downstream, the more metaphorically “expensive” that repair is going to be and it is more likely that student is going to drop out. Swarming seems contrary to common management practice because we are deliberately allowing a local problem to disrupt operations. Having all-hands-on-deck enables learning opportunities for all involved staff, and it’s how you build your problem-solving institutional knowledge base. This means that long-term these situations will be handled much faster because you have a large group of employees who have been exposed to the situation and solution previously. For this to be successful, you need to have a culture where it’s safe, even encouraged to pull everyone in when something goes wrong. Most staff are afraid to admit that something went wrong because that means they weren’t able to fix it themselves and they take it as a personal failure. The issue is sometimes buried, and unfortunately, it may be an issue that impacts multiple students. Hindsight is 20/20, but now that you have swarmed an issue, you need to get all the stakeholders together to create a timeline, understand what went wrong, who was impacted and what has been put into place to prevent a similar issue. If students were affected by the problem then there should be a student in the room. It’s essential, especially for more isolated departments to be able to have empathy for their users and they need to be exposed to the people most impacted. Most times you will say “we learned our lesson, and it’s just a training issue.” That is not a good solution. We’re trying to prepare for a future where we’re as stupid as we are today and it is not acceptable to have countermeasures merely to be more careful. Maybe the system should be smart enough to identify this type of user error? We must design real countermeasures to prevent these errors from happening again. This process is not about pointing fingers because all systems fail eventually. The most successful developer at Netflix brought down the system twice in 18 months, but he also deployed solutions that brought Netflix light years into the future. If you are going to make dramatic leaps ahead, then there are going to be occasional bumps in the road. That is why a blameless post mortem is essential. As time you backfill with the work that needs to be done because you were swarming to help resolve an issue earlier. As time you focus on how to make all your current workflows better and more efficient. As time you focus on documenting procedures and best practices. Faculty know the importance of metacognition with their students which is the awareness and understanding of one’s thought processes. This is why they have their students reflect on what they learned. Employees also need to have an awareness and understanding of their own thought processes at work. They need the opportunity to reflect on what works well and what could be optimized. You are not making people more idle by giving them less work to do, you’re making them more flexible, and you’re allowing them the time to respond to immediate issues that impact student success, as well as create innovative solutions to problems and exceptions. You need to be able to see how your college works as a whole. We are all guilty of focusing on our own department bubbles. Without the big picture, it is difficult to identify constraints, red flags or potential failure points. Pretend your department is an organ in the human body that works in conjunction with the other parts of the body which is your college. Sometimes departments do things that cause an unfair burden on the other departments. A department, for this example, we’ll say it’s the heart, is pumping fast and is proud of all the work they are accomplishing. They are taking all the accolades from administrations because they are pumping so fast as you know, in an organism, that a heart pumping fast is causing stress on the entire body. It’s pushing the blood flow downstream, and a majority of the work may end up happening by other organs, but the heart is taking all the credit. If we do not see ourselves as a whole, then the success of one department may lead to the detriment of another, and it’s crucial we have empathy for our counterparts. Providing opportunities to move into different departments is a good thing for the organization. When I first read this, I saw it as my personal nightmare, having to retrain employees constantly but I was focusing on my department and not the system as a whole. Employees build empathy and institutional knowledge as they shift between departments. It also forces you to have processes in place to prevent your employees from becoming constraints. Most positions evolve based on the skill set of the person in that role. Every year you tackle new initiatives, and goals and the position eventually expands outside the scope of your job description. You become the expert on multiple processes and unintentionally allow yourself to be a constraint within that department. Because you’re always doing the work, they do not see the inefficiencies or that they need to retire old systems. Everyone is replaceable. Sometimes it may result in a couple of people to replace you. As a manager, you never want to set up a situation within an organization where if someone leaves it takes three people to replace them. In factories before hiring additional staff, they experiment with multiple ways of doing things to see if there’s a better way to make their processes more efficient. When you’re not improving processes, things don’t stay the same. Due to the chaos, your processes will degrade over time. When you avoid fixing problems, relying on daily workarounds, then you’re building technical debt. Your workload is going to increase and eventually, you end up in this paralyzed situation where work can’t get done because you’ve let so many things get pushed down the line instead of fixing them at their source. Many times leaders are not close enough to work, the front-lines, to make informed decisions to solve a problem. The frontline workers don’t have a broad understanding of the big picture or the ability to make changes outside of their areas of the work. As a leader your job to listen to your staff and work together to ensure you are providing them the tools they need to be successful. Every department needs a central location for sharing and collaborating files. Working locally on files leads to versioning conflicts and someone having to consolidate changes. Consolidating changes when you could have just worked from the same version is a form of waste in your value stream. Also, you should reward and allocate ample time to ensure documentation is created for every project that is accurate and easy to follow. Often documentation is neglected because it lacks the visibility and rewards provided by the project deployment. Unfortunately, you step away from the project, and it may be six months before you have to dive back in. You end up spending wasted time re-acquainting yourself with the systems and settings because you did not correctly document how you left things. Knowledge lost is a form of waste in your value stream. You should try to create checklists and standardize every business process BUT accept that there will always be exceptions. Those exceptions can lead to failures in your value stream so you need to have standardized tests that can detect abnormalities, especially if they can result in catastrophic consequences. When you discover an issue, as we learned earlier you swarm it. If it’s the first time you are faced with that issue, then you need to try to create early indicators to prevent a repeated problem. After you have solved the issue, typically you moved on to the next pressing issue and that institutional knowledge you gathered is lost. This is a teachable moment for your organization. You need to share globally how it was resolved and what practices you put in place to prevent it in the future. You may have professional development where an outside expert comes in and presents a topic. The most valuable learning comes from mentoring and teaching other employees. At Nationwide Insurance, they have teaching Thursdays, where each week they create a time for their associates to learn and to teach each other. You want to give employees the opportunity to engage with their peers from other colleges too so encourage they attend conferences. Encourage that they speak at the conference because it will help grow their network of resources when problem-solving. Continuous delivery is about making frequent, small, incremental changes instead of pushing a brand new system and overhauling everything at once. The canary release is when you release your changes to a small subgroup of your users so that you’re not breaking things for everyone. If that subgroup experiences issues then you can quickly roll back that subgroup. If we translate that to Student Services, the canary release pattern would be that you identify a subset of students and consider them your pilot group. You implement these new business processes with this subset of students. If it works well, consider it a successful proof of concept then you implement that for all the students. Consider telemetry as success checks, where you are collecting data about students, and you want to be alerted of abnormalities. Every student service should have tests in place that are indicators of a student deviating from success actions. Students need warnings to let them know if they’re on the wrong track. It’s essential when you start sending notifications to students that you consider alert fatigue. We need to be more intelligent about the alerts we send students. If you saturate student with announcements, then they become desensitized to these alerts. The alerts become noise that is ignored. A common practice in DevOps is to have alerts broken down by severity, such as informational, warning, error or failure. You may want to provide a severity level on each of your notifications, so students know where to focus. Plus, ensure you send informational alerts when a student is doing well to let them know they are on a successful path and not always point to their potential to fail. Brainstorm your early indicators for students to identify when they have deviated from their path. If the student has not registered for the courses that are in their ed plan. If a student isn’t showing up for their appointments. If a student isn’t showing up in class. If the student’s current grade is below, let’s say 70%. If a student hasn’t logged into Canvas within the past week. If every student action is measured and monitored, and any defect or significant deviation is quickly found and acted upon, then you are setting up a safe environment for students to explore without fear of long-term consequences. We need to be to identify what is considered a deviation by a student in the value stream, what are the indications of failure. Your goal is to build resilience so even if a student is in danger of failing that they can still be successful. There should also be autonomy in your automated testing by developing a modular architecture, and it has to be loosely coupled. That means every student service needs to have their own automated tests for students. You cannot be reliant on multiple services working together for a student to find out if they’re successful or not. One of the ways to test new features is A/B testing, where you have a subset of students do something one way, and another subset of students do something the other way, and you learn by observing which students are more successful. If you work for a college district, then you may be doing this indirectly. For example, in my district, we have three colleges, and each college tends to do things slightly differently. They also tend to measure their success by different rubrics. If we were to measure the success of each college by an identical matrix, then we could identify what works and share that knowledge so that every student can benefit. Pair programming is when you work in pairs on writing code instead of working in isolation. Nobody’s perfect and even the best programmers excel from having a second brain reviewing their work. If we translate that to students, we already know from studies that students learn better when their peers teach them. This is because if one student has a better understanding of presented materials, then they can explain it in terms the other student can relate. It’s a common strategy used in teaching to pair students off to discuss presented ideas and ensure everyone is at the same level of understanding. It theoretically could provide significant value to pair our students with someone else who has a similar education goal. Consider it a two-person cohort, and you provide an outlet for a student to bounce ideas instead of having to work in isolation. Community Colleges tend to be a little bit more conservative and resistant to change and, like a large ship, are difficult to maneuver into new directions. We need to engage in an “Improvement Blitz” which is defined as a dedicated and concentrated period to address a particular issue often throughout several days. Our goal during these Blitz is not to merely experiment and innovate for the sake of testing new technologies, but to improve our daily work. What makes an Improvement Blitz so compelling is that we’re empowering those closest to the work to continually identify and solve their problems. Companies like Toyota have entire teams of engineers, DevOps facilities and coaches to work with every department. Consider for a moment that your college is like a spider web with intertwining strands that are continually weakening and breaking if the right combination of strands breaks then the entire web collapses. You cannot just react to that broken strand because the whole web has collapsed. Instead, you must create a culture at your college that leads to everyone continually finding the broken strands as part of their daily work. By implementing the practices above, you will build a more efficient student value stream, allowing your College to be more flexible and innovative. In order to maximize the effectiveness of any newly implemented technology, you need to first re-evaluate your business processes. If you want to delve deeper into any of these concepts and obtain a better understanding of how they are applied in large businesses then I highly recommend reading the “Phoenix Project” and the “DevOps Handbook” books, by Gene Kim, Patrick Debois, and John Willison.